What is cool about neural implants? It is almost like biblical healing: blind people see again, deaf people hear and paralyzed people will walk. All this comes with many ifs and constraints. Nevertheless, the progress made with neural implants is remarkable. (There is a possible dark side as well, o.k….) I did not find really good images of neural implants and how they work on the internet, so I decided to do some by myself. Current electrodes are too big to target individual neurons. The first thing I had to get clear was the size of the electrodes: they are much larger than I had thought. At best, small electrodes are comparable in size to the cell bodies of large neurocytes. An example for this case is given in figure 1: here a small electrode is inserted into the cerebral pyramidal cell layer. Even such small electrodes do rarely allow interactions with single neurocytes. They rather interact with all neurocytes close to the electrode tip. In most cases, however, relations between electrode size and neurocyte size are worse. Even the highest resolution optical chip, for example, has a pixel size of 70 x 70 micrometers. Rod or cone cells, on the other hand, have diameters of only a few micrometers (figure2).To non-experts like me it is surprising that eye or cochlear implants are working nevertheless. This apparently is due to the most important feature of the brain, which is not size or complexity but plasticity. Brain plasticity allows adapting to even very coarse interfaces and extracting information from such interfaces. Figure 1: Small microelectrode within the large pyramidal cell layer of the cerebral cortex. 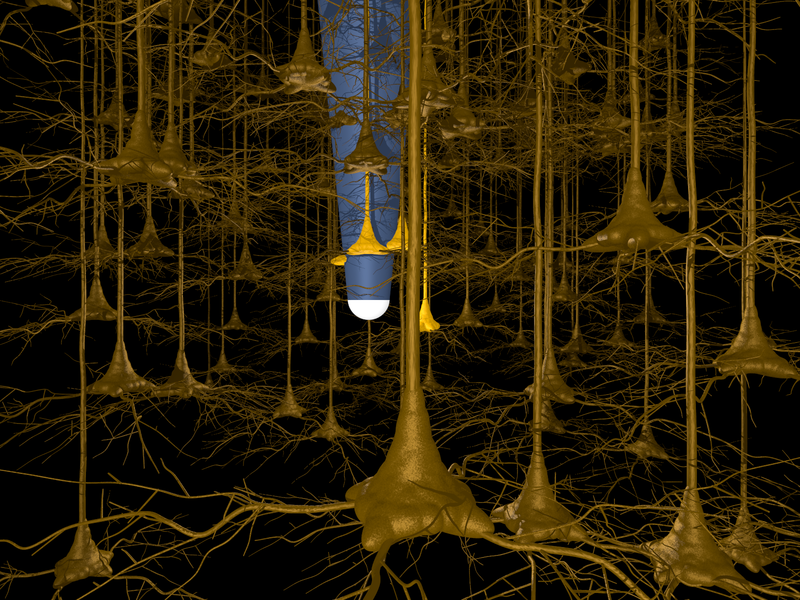 Electrode tip is comparable in size to large pyramidal cells. Electrode is interacting with cells in the vicinity to its tip (given in lighter colour). 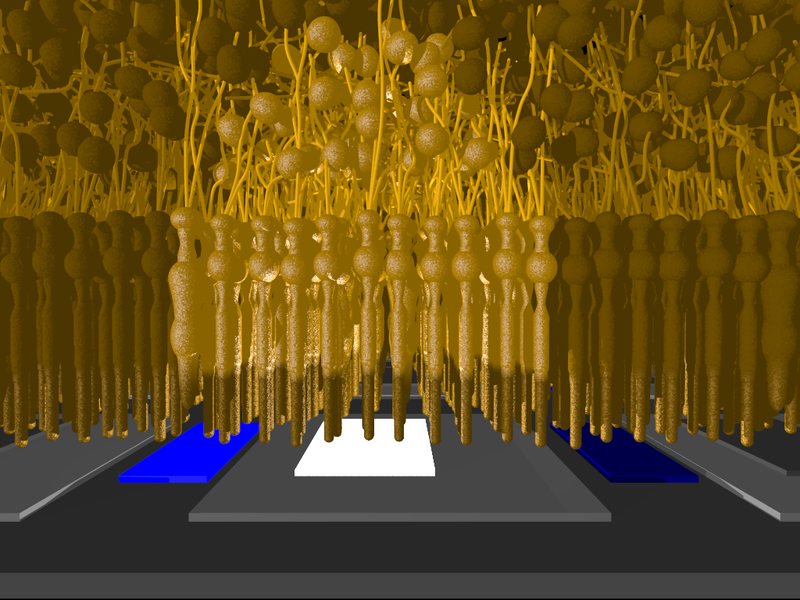 Figure 2: Subretinal chip together with adjacent retinal cell layers. The chip is implanted directly adjacent to the retinal photoreceptor cell layer. Its photodiode (blue colour) detects incoming light and generates corresponding electric signals (white electrode). Each photodiode/electrode unit corresponds to one pixel of vision. The lowest retinal layer comprises rods and cones as photoreceptors. Signals are transferred to the upper cellular layer, the „inner nuclear layer“, with various types of neurocytes. Cells (rods/cones/neurocytes) activated directly by an electric signal from a given photodiode/electrode unit (light colour) are given in light colours.